If you are familiar with the first two games from the American Adventures of Lolo series, you may be puzzled by Eggerland's non linear presentation. 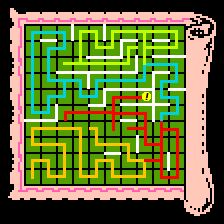 Instead of a sequence of stages that you proceed through in a predetermined order, you must navigate through King Egger's castle, clearing each room one by one. You begin your quest in the first room on the left of the bottom row of room. Only after you collect the map can you see your current progress through the castle by pressing , which brings up the screen shown to the right. As you clear each room, a set of doors will open up, allowing you to choose which direction to travel in. Although you may be able to access a room from a certain direction, you won't necessarily be able to clear it from that direction. Some rooms may be entered from multiple directions, but can only be cleared by entering it from one particular direction. Once you become familiar with the game, it will become obvious fairly quickly whether a room can be cleared from the direction that you entered. In each of the stage descriptions, one or two of the exits may be highlighted to indicate which direction is recommended. In addition to know which direction to enter a room from, you should also be able to determine the relative difficulty of the room. For each description, a room is ranked on two levels of difficulty; strategy and agility. The rankings range from one star for easy for four stars for difficult. Consult the following charts for more information. ★ The room requires little to no strategy, allowing you to collect the Heart Frames in roughly any order you please. You can take your time clearing this room, as there are little to no physical threats that pose a danger. ★★ A little planning or forethought is required to get through a few of the steps in this room, but you are not bound to only one method of clearing the stage. A Skull, Alma, or Don Medusa may be present in the room, but you should be able to deal with them and prevent them from becoming a nuisance. ★★★ The steps to clearing this room must be planned out or some specific knowledge is required, such as where removed monsters might reappear if you put an Emerald Frame over their original location. A good number of moving threats must be avoided as you move through the room. Multiple Almas must be dealt with, or you must bravely tread where Don Medusa's might be able to see you. ★★★★ In order to clear this room, you must carefully follow a long set of specific instructions. One mistake will prevent you from clearing this room, and you will have to start over. These rooms typically contain many Almas with few restrictions or safety zones. These rooms are the ultimate test of your reflexes. In addition to these rankings, some rooms have a unique feature that must be exploited in order to clear the room. These features show up under the "?" in the lower left corner of the screen. For example, if a treasure chest is shown in the "?" box, the solution will involve performing some action on the chest, such as touching it, or shooting it with an Egg shot. Always be on the lookout for these unusual rooms (there are only a handful of them), and keep your mind open to unusual clear methods. Shown to the right in an enhanced view of the King Egger's castle map. The white walls indicate sections where passage between two rooms is impossible. The castle can be roughly broken up into four sections. You being in the lower left corner, and progress through it is fairly linear until you get closer to the right side of the castle. You can only travel through the lower half of the castle until you discover the room indicated by the yellow "!" on the map. 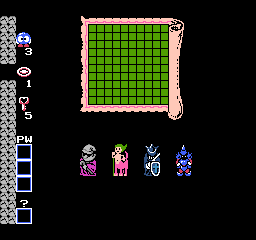 This room serves as the key to accessing other parts of the castle, as well as the final set of stages at the end of the game. In order to defeat the game, nine specific rooms hold secret chamber entrances. Five of these entrances will appear as soon as the room is cleared, and will lead to a special room where you must go from your start point to the treasure chest in the scant amount of time provided to you. If you succeed, you will collect one of the five large Keys that are required to access King Egger's final stages. The remaining four chambers are hidden from sight until the room is cleared and one of the Emerald Frames is moved from its starting position. These entrances lead to rooms just the the Key Chambers, only success will reward you one of the blessings of the four guardians which is also necessary to clear the game. Since you won't know which rooms these four chamber entrances are hidden in unless you move the right Emerald Frame, it can be a daunting task to identify these four rooms. However, you are given one hint: When you travel through the dungeon entrance in the room with the yellow "! ", you are taken to a region that branches out to four other rooms. When you clear these rooms, another chamber entrance will appear which will warp you to some other location in the castle. The four rooms that you are transported to are in fact the four Guardian Chamber entrance rooms. This page was last edited on 16 May 2010, at 01:06. This page has been accessed 3,593 times.